My friends and family often ask me for easy to make recipes, a one pot dish, something that requires little or no clean up. At the same time everyone wants the dish to be packed with flavor, preferably all natural and whole some too. 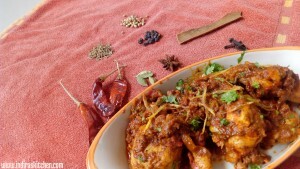 The other common request is to ways to spice up the everyday chicken curry. I think I have met all the requirements with this one dish – Arabic Chicken. The other day as I pondered on what recipes to submit to Vanitha Kaula Pachakarani 2015 Competition, I remembered this Arabic Chicken dish, packed with flavor, yet it’s not spicy-hot. The more exciting news is that my Arabic Chicken recipe was selected and I got a call to audition for the Vanitha Kaula Pachakarani 2015 competition. I am all excited; will let you know the results of the competition but meanwhile hope you enjoy making and savoring this dish as my family and I did. 1. Marinate the chicken breast in lemon juice and salt. Keep aside. Marinate for ½ hour at minimum. For best results marinate for 3 to 4 hours or overnight. 2. Heat the oil in a pan; add sliced onions and sauté till light brown. 3. Add ginger garlic paste, sauté few minutes till the raw smell disappears. 4. Add Chicken and cook till the colour of chicken changes to light brown on all sides. 5. Add the chopped tomatoes and the beaten curd (Yogurt). 6. Add salt, pepper, and Arabic spice powder. Cook until the meat is tender and the gravy is semi dry and has coated the chicken well. 7. Sprinkle roasted sesame seeds. 8. Serve hot with rice or pita bread.